Perhaps a few visitors to BusinessObjectsTip.com have already noticed that we posted a new guide for BO XI Query Builder on the site last month. Due to some technical difficulties and lots of other lame excuses there was trouble finding and ordering the guide. 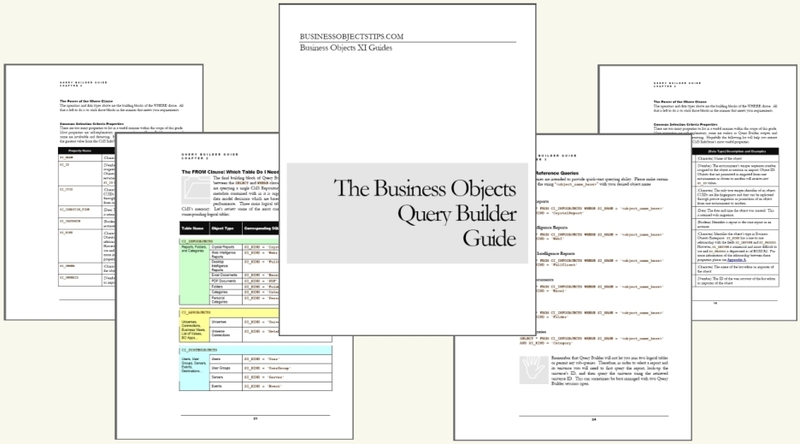 These obstacles have been overcome now and I would invite you to check out “The Best Business Objects XI Query Builder Guide Ever Written!” We know that you will find it valuable and that it will turn you into a Query Building Genius! I am business objects developer. I would like to write query ‘which user has modified rights for particular group, and when’. Hi Prahadir, I think you would need a sophisticated SDK app that would audit security on a daily basis in order to achieve what you are after. Security queries against the BOE CMS are very difficult and I usually avoid them. « Which Business Objects Auditing Activities or Events Capture BO Universe Name?